He is interested in engaging with his students and fostering learning of science with other disciplines, such as the beauty of mathematics in the world, the bridging of math with sound in music, or the image of rainbows, to name a few examples. He wants to foster an experience of wonderment at the entirety of God’s creation. Daniel has a variety of research experience, including Chemistry work at Argonne National laboratory. 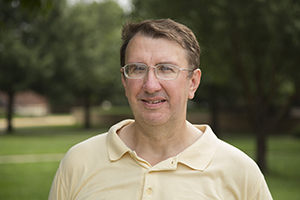 His most recent research is on the study of high temperature atomic reconstruction of insulating materials, and has experience with transmission electron microscopy as well as atomic force microscopy, scanning electron microscopy, and x-ray photoelectric spectroscopy. His work is important in understanding how glass and other materials may change their properties under extreme conditions.